"Shazam!" follows 14-year-old foster kid Billy Batson, who finds himself chosen to inherit the powers of the ancient wizard Shazam, who protects humanity from malevolent mystic forces. When the spiteful and bitter Dr. Sivana's (Mark Strong) lifelong obsession leads him to discover Shazam's lair, releasing seven demons that he had imprisoned in the process, Batson has to learn to use his newfound abilities, activated by uttering the wizard's name, to become the adult-bodied superhero formerly known as DC's Captain Marvel, while reluctantly leaning on assistance from his newfound family whom he debates abandoning in the pursuit of his oddly absent mother. The modern superhero genre may largely exist within a range of appropriate material for middle schooler and up, but the further it’s moved towards adapting to cinematic sensibilities to tell narratives in a more contemporary fashion, the more core characterizations of the genre and aspects of its history have been lost in the name of accessibility. 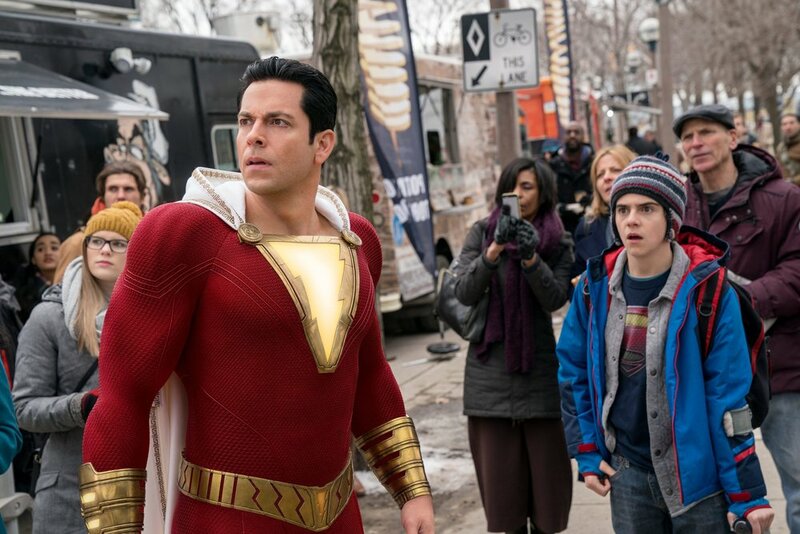 Enter “Shazam!,” a movie more unapologetic of its wish-fulfillment-power-fantasy roots than any movie released in the last decade with the possible exception of “Spider-Man: Into the Spider-Verse.” Director David Sandberg may be best known for his creativity with horror premises but his skills for infectious atmosphere and striking visual direction guide him well in a film that firmly embraces the nature of its subject matter. Similarly to the “X-Men” franchise’s “Deadpool,” “Shazam!” aims for metatextual commentary on the superhero genre, which means that a lot of its tropes, for better or worse, get played on the nose. Existing within the failed experiment of a shared narrative informally known as the “DC Extended Universe,” the film pays a lot of lip service to the legacy, iconography and tropes associated with DC’s most famous cash cows. Batson’s brother Freddy drones on about the magnificence of these heroes in a way that would imply they’ve undergone a multitude of publically lauded, trope-tastic, larger than life, widely known adventures that falls apart if you think about the movie Batman and Superman were actually featured in regarding this setting. Mark Strong really does his damndest to inject his presence into a throw away villain role that never quite escapes being just that. Despite the charm apparent in Batson’s new foster family, the film doesn’t quite give them all the development that would have made his adventure of accepting the family he found rather than chasing the one he lost resonate as warmly as it was clearly trying to. Coupled with the above flaws is additionally a persistent editing problem that these DCEU movies have consistently run into; “Shazam!” clocks in at over two hours in length and is in desperate need of a 15-minute trim, or at the very least appropriate that time towards more character development of the side cast. While all of these flaws would be substantial marks on an otherwise solidly crafted product, they are firmly overcome by the brilliance of the movie’s charming premise and execution. 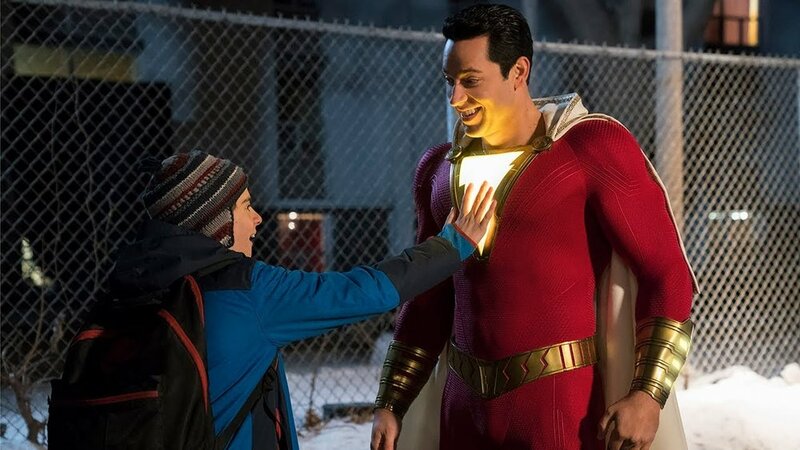 Above all else, while “Shazam!’s” antics may run a tad too long in terms of overall runtime, the troubled-but-loveable Billy, portrayed by Asher Angel and Zachary Levi in adult form, is a riot and a half to watch. The character is consistently funny, charming, and relatable in the way only a good natured but rambunctious teenage boy receiving the most useful set of superpowers could possibly be, but not backing away from his human sense of selfishness and immaturity that he still has to outgrow. The humor, heart, and energy are propelled forward by action sequences that are limited in quantity, but exciting and to the point in their makeup to present a wholesome family feature that almost feels like the sort of inspirational genre filmmaking of a bygone era from over two and a half decades ago. The larger than life, continuity driven epics were nice for a time, but I couldn’t feel more refreshed after coming out of a movie that not only accepts that it was born from power fantasy but outright owns the identity and celebrates the need for it to grant us catharsis to be our better selves. Although “Shazam!” may not be the most polished of superhero movies of the modern era, it once more represents a move towards a certain type of visionary filmmaking returning to the genre that I’m almost in tears over.